When it comes to moving the ball around the field most youth playing baseball or softball believe there is only one option: throwing the ball overhand. It is critical for coaches to educate their players of the second and third options early in the season and then teach the kids to recognize the situation where the underhand toss and carrying the ball are the best techniques to use to move the ball. Many drills involve the underhand toss. We want to incorporate drills in every practice that involve the underhand toss. Carrying the ball rather than throwing it is determined by the situation in a game. A scrimmage is where the kids are exposed to these situations multiple times. We want to conclude each practice with a scrimmage, not only to help our players recognize situations where they want to transport the ball by carrying it, but also to give them experience in executing the skills learned in drills within the context of a game. This is a Major League Skill. In any given MLB game the underhand toss is utilized 5-10+ times. 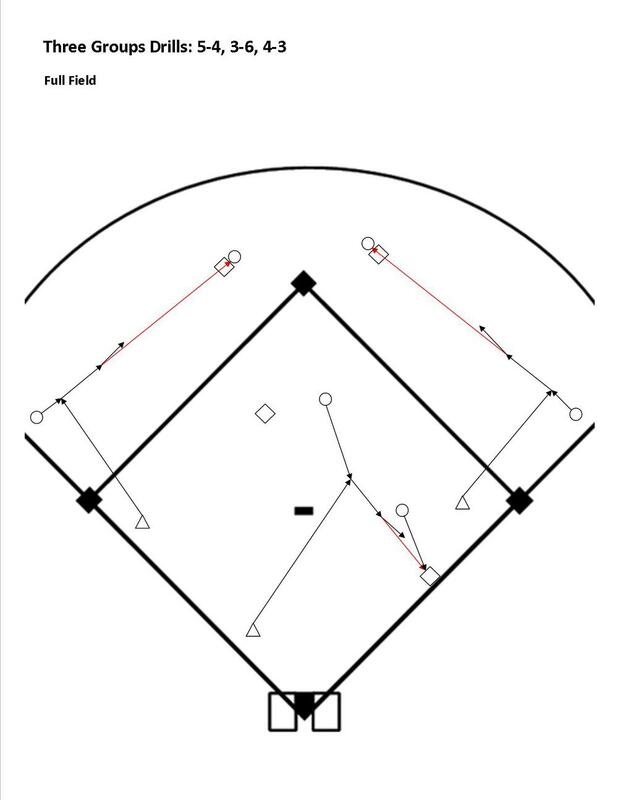 On the smaller diamond where the players are positioned closer to each other there is a higher percentage of situations where the distance the ball needs to be transported a short distance. Educating our kids that an underhand toss is an alternative option and then drilling them daily in this skill results in kids successfully completing many of these ‘simple’ plays, which in fact are very difficult when throwing the ball overhand is the only option in the mind of the player holding the ball. Most every youth ballplayer believes that the only way transport a ball around a baseball or softball around the field is to throw it. We must make it understood that ‘There is no rule against carrying the ball’ and then constantly point out to our players situations when they want to carry the ball rather than throw it. As coaches we understand that each time the ball is thrown there is the risk of a mistake that can lead to the runner(s) advancing to the next base. Once the players understand the three ways of moving the ball around the field we teach the concept of the ball being in constant motion in defense. Another game situation most of us are familiar with is the player with the ball in their hands, not knowing what to do and just standing there, often while base runners are advancing to the next base. This is most common when the ball is in the hands of an outfielder and there are multiple base runner. Why? When a player is unsure of what to do with the ball, but at the same time are running toward the middle of the infield they are increasing the possibility for success when they finally do determine what needs to be done with the ball. When the ball is in the center of the infield it is a threat to a runner attempting to advance to any of the bases. Each step closer to the middle of the infield a player with the ball is, they are that much more of a threat to the base runners. They also shorten the distance of any subsequent throw they may have to make. Given the ‘rule’ that a player ‘Never Stands in Place Holding the Ball’ we reduce the likelihood of runners advancing to the next base. In situations when a player is fielding or picking up a ball with their back to the play they will need to turn around in order to throw the ball. When throwing the ball a player wants the 'glove side of their body pointing at their target'. The most efficient way to get lined up to throw is for a player to turn in the direction of their glove. Only a 90 degree turn is required to go from having one's back to the target to being lined up to throw. We use the teaching phrase, "Turn Glove Side" to remind players which direction to turn. Reality --- kids tend to turn the opposite direction. They turn to their throwing hand side. The reason for this is this is while making that 270 degree turn the kids get a good long look at their surroundings including where they will be throwing the ball. As coaches we need to consider the perspective of those we are teaching. Kids are still getting accustomed to their surroundings and the world around them. Making the longer 270 degree throw is only natural for a young person. It gives them a good look at what is going on. Unfortunately this is inefficient and requires them to go against the momentum of the turn in order to throw. Five players are needed to run this drill. Two at the base the drill starts and one at each of the other bases. Home plate is the logical place to start so we put two players there. Assuming 12 players on a team, we run this drill with six players; the sixth player can start second base. (We can set up a second diamond in the outfield using throw down bases, and have a second group of six running the drill on that diamond. Another option is to run another drill with six players in the outfield. If the other six player drill requires use of the infield, this drill can be the one run in the outfield. First base is considered a generic base regarding making a tag, which is put down where a runner coming from home would be sliding. We want the players to stay consistent in their actions and not have to do something different when taking a throw at first during the drill. This drill is all about the players being disciplined in their actions. it is our responsibility as coaches to police the actions (not results) in the drill. If the players get lazy with their movements (and they will) we stop the drill get them refocused and get them back at it. --> "Move Feet to Catch" / "Ball First, Base Second"
--> Put the tag on the ground on the side of the base the runner would be sliding into. (kids will often simply wave their glove at the base for the tagging action - we DO NOT allow this to happen. We stop the drill immediately and have that player make a proper tag. …all this is achieved WHEN the coaches/adults supervising the drill make sure the players execute it as it is designed. When the players stray from proper execution, the coach/adult running the drill must immediately stop the activity, re-emphasize the proper actions, re-establish expectations, do this in brief and to the point manner, then get the drill going again. This drill can be run on a full sized diamond with the players making overhand throws or on a MINI Diamond with the players using the underhand toss technique. The drill on the MINI DIAMOND is the same as that on the full sized diamond. The throwing technique is obviously different; the other aspect that is different is that most throws will be very accurate and the players receiving throws are not getting much work/discipline building in regard to “Move Your Feet to Catch”. The ideal number of players for this drill is five; two players at the base the drill begins (home plate is the logical spot to start) and one at each other base. The math for dividing up a team of twelve often results in having six kids in this drill, so we have two bases with two players. Note 1: When working on the Mini Diamond, a group of four players can work. The coach/adult that is running the drill jumps in and serves as the fifth body. Four players in a drill is the ideal number; allowing three groups of four players to work at three different stations/drills simultaneously. Note 2: We don’t want to run this drill with more than six players. This results in too much standing around, which is the death knell of a youth softball/baseball practice. The player with the ball creates momentum towards the base they are throwing to by “Moving Their Feet to Throw”, after throwing the ball they “Follow Their Head” and rotate to the next base. The player receiving the throw stands in a “Ready Position” facing the player throwing the ball and with their feet in a proper relationship to the base to make the catch and then apply a tag (the relationship of the feet to the bag is different in the 12U game, than at the teen, college or pro levels – this will be covered in detail as the Coaching Guide is updated in Jan-Feb). The receiving player then starts towards the next base and the drill continues. Coach rolls a ball to the center fielder. Mix up locations between left-center and right center field, so the pitcher gets the idea that they move to different spots depending on the location of the ball. *The key to getting lined up is for the pitcher to ‘look both ways’ (same as they would do before crossing a street). Look to the ball, back to the plate, look to the ball, then back to the plate… this exercise enables the pitcher to identify the ‘line’ between the ball and home plate. They want to get on this line as quickly as possible. Note: young players are resistant to looking away from the ball. It will take them a few days of working in this drill before they start making it a habit of looking both way. Remember, we are asking the pitcher to do a lot of stuff in a short period of time in this defensive situation. Their young brains will require some time to get this…be patient as a coach. The WILL get it after a while. Catcher moves out to their ‘position’ a foot in front of home plate. As the ball is on its way from the center fielder to the pitcher the catcher hollers, “Cut Four”. After catching the ball the catcher puts a tag down on the ground where the base runner will be sliding into home plate, then makes a shuffle step out towards the middle of the infield, in a power position, to “Look for other runners”. Outfielder fields the ball and waits for the pitcher to ‘call for the ball’ (In this drill the outfielder will often get to the ball before the pitcher gets into position. In a game the pitcher will get into position on time. In a game we rarely want to delay getting the ball in). Note 1: Because the players are fairly close to each other in this drill, we have them use an underhand toss to transport the ball. Note 2: On a full sized field the Shortstop would move out towards the center fielder and the second baseman would cover second base. If the ball is way over to the right field side of right-center field the second baseman goes out and the shortstop covers second base. There is not set rule as to when these responsibilities change. Over time the players will develop and instinct for this (in reality this is an instinct the players develop at an older age). Note 3: The shortstop and second baseman ARE NOT the cut-relay player on balls hit in front of the outfielders. A common mistake in 12U baseball and softball is the outfielder making a short throw to the shortstop or second baseman (thinking that is the cut-relay player). The infielder is then left to make a very long throw to the catcher. 1 - The base runner(s) stop trying to advance to the next base and/or the runner going home is going to score easily. In this case it becomes a ‘get the ball back in to the infield play’. The outfielder hands the ball to the infielder or gets it to them using and underhand toss. The infielder then runs the ball in to the pitcher. We constantly remind our players to ‘Call for the ball’ on pop flies. However, we still have numerous occurrences where two players get in each other’s way trying to catch the ball or they both stop going for the ball at the last second and let the ball drop. Then we holler at them again to ‘Call for the ball! Below is information on a Fly Ball Communication System for balls hit between two players. When practiced, this system greatly increases the number of balls that are caught and virtually eliminates collisions. The key to the system is we use two different calls for fly balls. One call is made by the player who is determined to be subordinate; the other call is made by the player who is determined to be dominant. The subordinate player calls, “Mine”, which indicates that they are confident they can get to the ball. The dominant player calls, “GET OUT!”…this is self-explanatory. The first diagram illustrates the dominant-subordinate relationship between all players on the field. The second diagram illustrates the set up for the Fly Ball Communication Drill. The players are divided into three groups of four, each having their own coach running their group. One group is taking ground balls at third base and second base, another group is taking ground balls at shortstop and first base. The third group is working on fly balls in the outfield. The outfield group should use this time working on angling back to fly balls (they get work angling in during the Skill Building Warm-up). Run this drill a couple of times with only two of the groups before running it with all three. When running it with two groups have the third group doing a drill in the outfield; maybe toss drills. Still rotate the three groups every three minutes, so that all players get reps in the Pitcher's Fielding drill. Trying to run it the first time with all three group can be a bit confusing for the players. After they get a couple days of experience working with just two groups they will be comfortable working with all three groups working at the same time. This is a great drill for getting a lot of practical work in, in a short period of time. NOTE: The 1-6 Play on the full field (drills, scrimmage and games) the pitcher makes an overhand throw (not to be confused with the 1-6 play in the Skill Building Warm-up version, which is done using Mini Diamond where the an underhand toss). NOTE: the coach/adult running the drill serves as the base runner (the majority of kids want to play ‘pickle’ and will not demonstrate the self-discipline required of the base running in the drill. Also, the coach/base runner will only jog during the drill. We want the player with the ball to understand they could tag the base runner out every time in the drill if they tried. We make it clear that the focus of the drill is to learn and practice the actions of the Rundown-Ambush. The base runner/coach is participates only to provide context for the actions. Two coaches --- one delivering the ball to the shortstop; one at the first base bag. Coach delivers a ground ball to the shortstop. Pitcher “Moves Towards the Ball”, doesn’t field the ball, so moves in a straight line towards their to cover the base, sees the third baseman covering, so continues on to foul ground to back-up a potential throw. Shortstop fields the ball and throws to first base. Left Fielder chases the ball at full speed to a point beyond where the short stop is attempting to field the ball. If the ball gets past the shortstop, the left fielder fields the runs the ball in (we are assuming the only base runner is the batter and that the batter stopped at first base) and hands it to the shortstop or second baseman who then runs the ball toward the pitching rubber as they would in a game. That player can then toss the ball in to the coach at home plate. If the shortstop fields the ball the left fielder moves in to position beyond second base to back up a throw to second from the right fielder who will be picking the ball up following the overthrow of first base. Second baseman “Moves towards the ball”, they don’t field the ball, so they cover second base (the base to their left; the ball was hit to their left) and gets in a ready position facing the right fielder who is recovering the over throw. The second baseman “Moves their feet to catch” the throw from the right fielder, tags the ground in front of second base where the runner would be sliding, then shuffles towards the middle of the infield, in a power position, “Looking for other runners” …then tosses the ball in to the coach at home plate. The coach at first base gives the short stop a target to throw to; hopefully the result is a strong accurate throw to the coach at the base. The coach, however, steps aside and intentionally lets the ball go past them resulting in an ‘overthrow’ for the right fielder to back-up. Right Fielder sprints toward a point beyond first base to back up the throw. The right fielder will most likely not get to the spot they need to be in to directly back up the throw. Instead they will play the carom off the fence of the overthrown ball. The right fielder recovers the ball turns, so their glove side is facing their target (second base where the ‘runner’ is headed when they see there was an overthrow. Likely the right fielder will ‘have their back to their target when recovering the ball; if this is the case they “Turn Glove Side” to get their body in position to make the throw. “They move their feet to throw”, then “Follow their head”, in a straight line towards the target, after making the throw. The concept of 'Three Groups Drills' is based on a team having 12 players and 3 coaches/adults being available to run drills. In cases of younger players (ages 7-8) an extra adult(s) may be helpful to receive long throws, which these younger kids would have difficulty to catch consistently in a fast paced environment. Given the above numbers we break the team into three groups of four players, each with their own coach/adult running their particular drill. We run the first segment of the drill for 3-4 minutes, then rotate the groups. Depending on how much time we spend between rotations, the players can work at all three stations in 10-15 minutes. There are four examples below. Given these examples, looking at the Skill Building Warm-up page and considering the needs of a particular team, a coach can design additional drill combinations. Tech "Step Across": A left handed throwing third baseman or a right handed throwing first baseman, when fielding the ball has their throwing hand side of their body pointing at their target. In order to make a throw these players, after fielding the ball must 'step across; their throwing hand foot with their glove side foot, which will result in the glove side of their body facing the target. The teaching phrase, "Step Across" needs to be inserted between the teaching phrases of "(Feet) Wide to Catch" and "(Move) Feet to Throw". Use two throw down bases to create two 'second bases'. Position them approximately 5'-10' short of the actual second base and 5'-10' behind the base line. This enables two groups to work on plays going to second base. This positioning of the throw down bases also minimizes the possibility of injury from an overthrown ball given that there is no other player in the line of a given throw. Use two more throw down bases inside the diamond to indicate second base and first base for the 4-3 play. Position the first baseman and third baseman close to the foul lines to make up for the change of distance of the positioning of the 'second base' they will be throwing to. Coach rolls a the ball a couple of steps to the left of the third baseman and instructs them "(Feet) Wide to Catch" and "(Move) Feet to Throw". The third baseman throws to second base, then follows their throw ("Follow your head"). The player at second base stands in a "Ready Position", "moves their feet to catch" and prioritizes, "Ball first, base second". The players then rotate positions. Same as 5-4 play, except we roll the ball to the first baseman's right. The players then rotate positions. Note: An advanced version of these plays positions the first and third baseman further off the foul line and the coach rolls the ball a few steps to the foul line side of the player. Right handed first baseman allow their momentum to carry their throwing hand foot past their glove side foot resulting in the glove side of their body facing their target. They then "Move their feet to throw" and 'Follow their head". ...the same action is executed by a left handed third baseman. A ball between the player and the line creates a back hand play for a left handed first baseman and a right handed third baseman. It takes more effort for these players to "Move their feet to throw", so as coaches we need to really emphasize to these players, "Move your feet to throw". Roll a ground ball to the left of the second baseman. They get their "(Feet) Wide to Catch" and "(Move) Feet to Throw", then "Move your feet to throw" and executes an underhand toss to the first baseman who "covers the base with their eyes" and gets in a "Ready Position" to prepare to receive the throw. The players then rotate positions. Third Baseman - Throwing across. Focus: "Wide to Catch" (slow down and come under control when fielding the ball), "Feet to throw", "Follow your head" (When players are throwing across the field it is especially important to train them in the habit of keeping their momentum moving in a straight line towards their target for a couple of steps after they throw the ball. This will make their throws stronger and more accurate. Remember that young legs don't have great strength and continuing momentum forward following a throw is not easy for them, They can get it and do it, but it takes a coach that continues to emphasize the need to 'finish the throwing action' by "Following your head". Left handed third baseman need the extra teaching point of "Step Across" after they field the ball. When they are under control when fielding the execution of this action is much easier. Later, and for older players, we can roll balls between the third baseman and the line. This gives right handed throwers a backhand and gives all players a longer and more challenging throw. Shortstop - roll the ball to their right. This can be a forehand or a backhand for a right handed player. For all players this is an overhand throw. Older players and players with good leg strength can execute this throw without a shuffle of the feet. But they still need to be taught to use their legs to drive their power and momentum straight towards the target. On shorter throws such as this a firm wrist snap is critical for accuracy. "Snap your wrist on that throw"
Second Baseman going back on a pop fly. 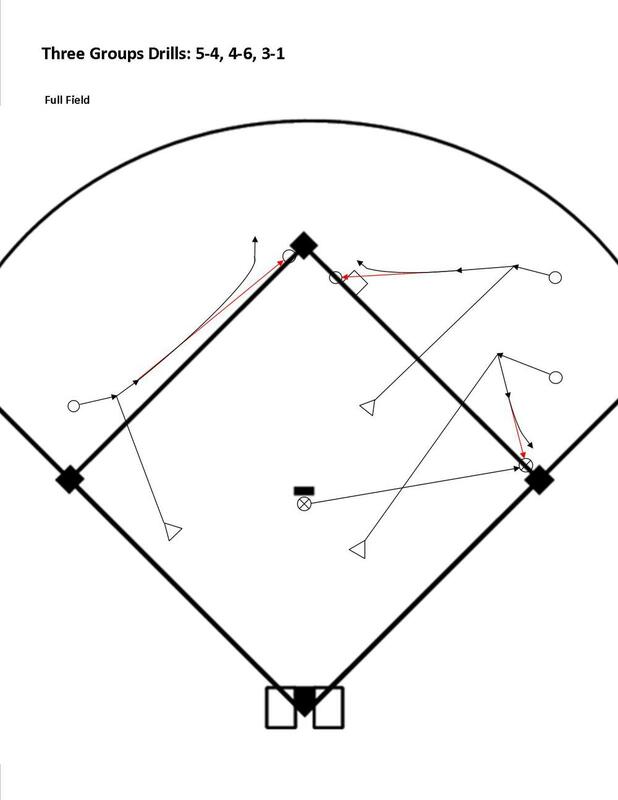 See 'Toss Drills - Fly Balls' diagram above. Third baseman throwing to second base - Focus: "Wide to Catch" (slow down and come under control when fielding the ball), "Feet to throw", "Follow your head"
Second baseman - Underhand toss to the second base bag. "Wide to Catch" (slow down and come under control when fielding the ball), "Feet to throw", "Follow your head". Rotate to covering the bag after the play. First Baseman and Pitcher, 3-1 Play: Coach rolls a ground ball 10’ to the first baseman’s right. Pitcher sprints to first and “Covers the base with their eyes”, gets in a “Ready Position”, “Moves Their Feet to Catch”, gets the “Ball first and the base second”, then tags the base witch their foot. Rotate to first base position. First Baseman feet “Wide to Catch”, then “Move your feet to throw”, then follow their throw - “Follow your head”. Rotate to the pitcher position. When running these drills it is important to maintain discipline in how the kids execute the techniques. There is a correct way to position the feet and body in relation to the ball. There is a specific technique in picking up the ball and when it comes to the throwing aspect of the drill, as with all throws, the feet must be moved properly. This drill deals with the situation of a runner trying to score from third base. However the actions of the catcher in this drill are the same they would use when a runner is attempting to advance to second base or third base on a wild pitch or passed ball. When a catcher veers away from using proper technique in picking up the ball and proper footwork throughout the action, remind them that while they are not making the longer throw to the other bases in this drill, the good habits they are developing in the drill will enable them to make a strong throw to any point on the diamond following a wild pitch or passed ball. when we have the pitcher fielding the ball the left fielder, as always, makes an aggressive first step towards the ball. One they recognize the ball will not be going to one of the infielders in front of them, they break to a position beyond third base, in line with the throw, to back up.